Alessandro Michele is the creative director of Gucci and has been since 2015. An Italian fashion designer who is known for his distinctive vintage style and is given much freedom with the support of the CEO and President of Gucci, Marco Bizzari. In 2017, the fashion house reported an exceptional performance with an increase of 51%. Michele’s contribution has certainly been a part of this success. With his understanding of the heritage of this fashion house and with his contemporary style and sensibility he is creating a successful brand development and narrative for Gucci. Michele who has worked under Karl Lagerfeld, Silvia Ventura Fendi and Tom Ford, graduated from Rome’s Academy and Fashion. Recognised by the British Fashion Council, he was awarded the 2015 International Designer of the Year. He was also awarded an International Awards by the CDFA. Followed shortly after this he was awarded the GQ Designer of the year in 2016. Under the direction of Michele, the Gucci Fall 2018/19 fashion runway show certainly deserved to be the headliner of Milan Fashion Week. Even the invitation was a mysterious masterpiece where attendees received an orange timer that came in a zip lock bag. On the front of the timer there was a sticker that read 'Parental Advisory, Explicit Content'. He named this show ‘Cyborg’. 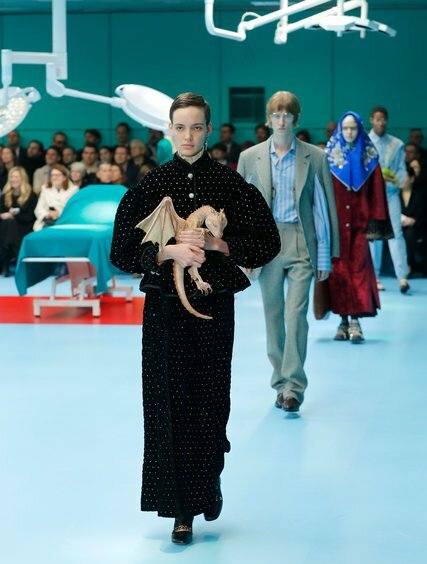 The runway itself was set in a hospital operating room as models carried snakes, chameleons, a baby dragon and even severed heads in the likeness of their own image. There were models with distinctive monobrows, knitted face masks and a big third eye blinking from a model’s forehead. When questioned about the messages in this Fall runway show Michele simply answered ‘We are all Dr Frankenstein of our lives’. That said in the context that Michele believes we are always experimenting, inventing and assembling with our identity which is expressed through clothes. On Friday 23 February, Gucci announced its plans to donate $500,000 to March for Our Lives making it the first in the fashion industry to throw support behind a campaign that the world is watching and hoping will change the course of history. This is possibly a very well planned savvy move given the pre-fall marketing campaign for Gucci was the youth of the 1960’s where there were many students meeting on university campuses, marching and campaigning against military and bureaucratic elites. And that of course is Gucci a brand very much focused on the millennials and their values. The world is watching Gucci closely as the year unfolds.